Impact Wrestling Results (11/7/13) - Full Metal Mayhem! Dixie Carter is walking backstage with Pacman Jones. She welcomes him to the arena and says it is glad to have him back. He is glad to be back. Mr. Anderson steps in their way and says he wants a match with Bully. Dixie asks if that is it because she would have to throw him out again. That&apos;s all he wants. Well, that&apos;s it, but Dixie wants him to deliver and take him out. She introduces Ken to Jones. They shake hands and Dixie leaves with her man. A video plays showing AJ Styles winning the TNA Title at Bound for Glory. He took the title, the car Dixie had for him, and leaves the company. Dixie sets up a tournament to crown a new winner. 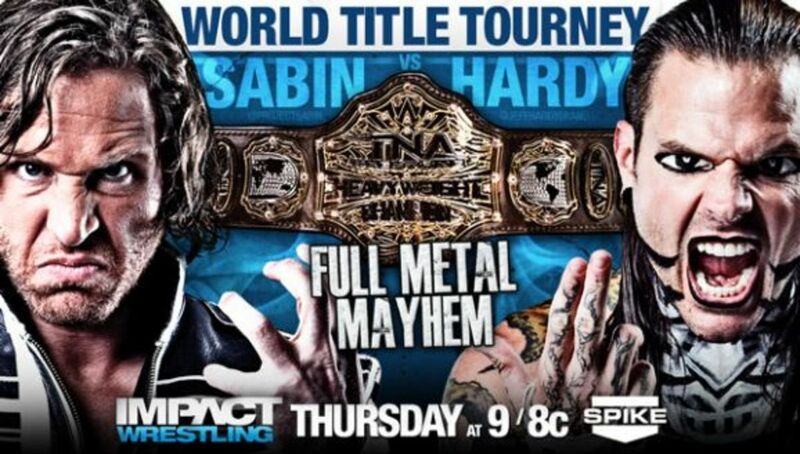 We will see Chris Sabin vs. Jeff Hardy in a Full Metal Mayhem Match tonight. The camera shows the arena and the crowd is on their feet cheering. They are ready to kick off the show. The camera then shows Pacman Jones at ringside sitting with his friend. He kisses the lady to the left of him. Music plays and here comes The Main Event Mafia. Joe leads the group and the Magnus and then Kurt and then Sting. They get in the ring. Sting grabs a mic and does a "Wooooo"! He starts by saying he formed the Mafia in June to get get the title away from Bully Ray and to take out Aces & 8s. As of now, job accomplished. They took some bumps along the way and faced it all, but they did it. Sting says, until further notice, Mafia will be put back up on the shelf. The crowd boos. Sting says they all agreed on this decision. Everyone is going in their different ways. For Sting, he could have went to fight for the TNA Title again but he came up short. Magnus took the spot. He seized the moment. Sting says Kurt will seize the moment and become TNA World Champion once again. Joe will seize the moment and be champion once again. 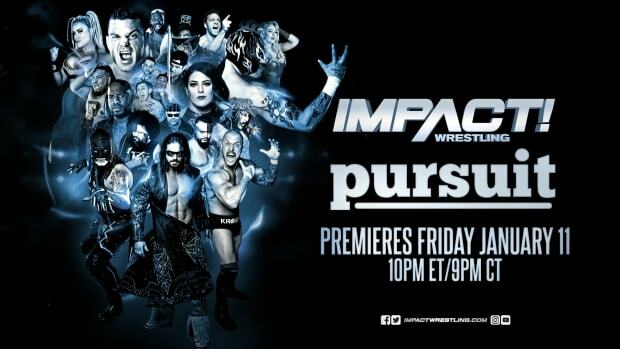 Magnus will seize the moment and become TNA World Champion for the first time. Sting is going to deal with entitlement. People believe this business owes people something. He is talking about people who come in right on top without paying any dues. He was not taught that in this business. He has respect for this business and respect for the people who came before him. Sting goes on to hug Kurt, Joe, and then Magnus and says he loves them. Sting hands the mic to Joe and exits the ring. He walks up the ramp. Joe says hello to Cincinnati. He says he had the backs of the other members for awhile, but he has been held down for the title for far too long. The road begins with Magnus and it will probably lead to Kurt too. They are friends but they make far better enemies. Joe hands the mic over to Magnus and leaves the ring. He walks up the ramp. Magnus says that there are only two left. He says Kurt is on the road of redemption. He praises him as he is one of the best of all-time. His road to redemption just so happens to be Magnus&apos; road to destiny. He loves Kurt like a brother, but he wants to tell Kurt to his face that when he goes through Joe and gets to Kurt... he will run him over. He has gold on his mind. He has Championship gold. For the first time, he plans to be World Champion. Magnus hands the mic to Kurt and leaves the ring. He walks up the ramp. Kurt Angle stands alone and looks around at the crowd. Kurt says it has been an honor and privilege to run with the guys for the last several months. They all have goals to obtain. Kurt&apos;s is to be World Champion again. Kurt says he must do this. He must do this to be Hall of Fame worthy. He was told not to wrestle last week but he did and was knocked out again. He talked to his own doctor this week and he said... before Kurt went any further Bobby Roode&apos;s music hits and he comes out to the ring. Roode says he is embarrassed for Kurt. He makes excuse after excuse. He tells Kurt to be a man and admit that he lost TWICE! Back to back to The It Factor Bobby Roode! He tells Kurt to move on. Roode will move on as the World Title tournament is upon us. Roode is in it. If Kurt gets to the finals, Roode will have no problem kicking his @ss for the third time. Roode is right in the face of Kurt. Kurt looks him right in the eyes. Kurt gets back on the mic and says he has Austin Aries next week in the first round. He expects to meet Roode in the finals. When that happens, his @ss is Kurt&apos;s! He may not want to wait though. Kurt hits Roode on the top of the head with a mic. Roode goes down and Kurt goes on top but Roode stands and goes after Kurt. They are right on each other punching back and forth. Officials and referees enter the ring and break it up. Kurt breaks from them and spears Roode down. Roode punches back. The officials/referees try to pull them off again. Kurt has a chair in the ring and sits down on it. He says he will wait all night if he has to. He calls out Roode. He wants him. Come out here! Roode does come down the ramp. Kurt leaves the ring and they rumble on the entrance ramp. Officials and guards come out again and try to separate them. They have Kurt go up the ramp while some officials bring Roode in the ring and keep them there. One of the officials is Al Snow. Kurt puts his hands up and then runs through the referees. He runs down the ramp and slides in the ring. Roode pounces on him and beats him up. Roode is lifted up and Kurt is held back. Bad Influence now comes out and holds Roode back while Joe and Magnus come out and hold Kurt. Kurt goes and runs to Roode again. Roode runs to Kurt. They push them back once again. Kurt exits the ring. Angle&apos;s music plays as he walks up the ramp. Roode yells at Kurt from the ring as Kurt finally goes backstage. Mike Tenay and Taz are shown at ringside as they hype tonight&apos;s show. Bad Influence are at ringside talking rash to Pacman Jones. Quinn Evans is with Jones. Just then, Influence pushes both of them. Jones and Evans jump the railing and get right in the ring as Influence run. Influence turn and fight them, but Jones and Evans lift Influence up and body slam them. Influence roll out of the ring and walk up the ramp while the Bangels&apos; members celebrate. Jeff Hardy is shown backstage entering the arena earlier today. The camera then shows Chris Sabin walking backstage earlier today. A three way camera shot shows Velvet Sky, ODB, and Brooke walking backstage. They fight next. Knux and Garett Bischoff are walking backstage. They state the condition of the group is none of our business. It&apos;s club business. Just then, Mr. Anderson comes in front of them and states he only wants a match with Bully Ray. He then states the best thing that has happened to him is what they did to him. Garett and Knux can do what they want, but Anderson knows his role. Anderson leaves the scene and Garett and Knux look at each other. Velvet Sky comes out to the ring. She gets in the ring and let&apos;s the pigeons loose. Brooke comes out next and gets in the ring. Music hits and here comes ODB! She drinks her flask and then gets in the ring. The bell sounds and Brooke goes in front of all of them and bounces her booty. Sky goes on the apron and let&apos;s the pigeons loose. Brooke shows off her body once again and turns around but ODB smashes her down. Brooke goes to the corner while ODB grabs Sky and whips her in the corner. Sky and Brooke sit in the corner and ODB does the Bronco Buster to both of them. ODB drags Sky out of the corner and goes after her, but Brooke does a roll-up on ODB. She kicks out. Brooke takes ODB out of the ring and she focuses on Sky. She whips Sky in the ropes but Sky comes back with a kick to the chest and then an elbow and closeline. She covers but ODB enters and stops the count. She lifts Sky up and does a powerslam. ODB stands and Brooke goes right after her with kicks and punches and hits a spinning neck breaker. She climbs the corner. She does a flying elbow. She then holds her elbow as she may have hurt it. Just then, Gail Kim and Lei&apos;D Tapa come out from backstage and walk down the ramp. All three are in the ring and ODB punches Brooke and Sky. Brooke hits ODB then. ODB hits her and Sky back. Sky punches back. They continue but ODB does a huge hit to Sky and then knocks Brooke down. ODB goes for a half boston crab and then Sky joins in and does it to the other leg. They let go and go after each other with chops to the chest. Sky runs in the ropes and ODB does a huge closeline. ODB lifts Brooke up and does a body slam as she smashes Brooke down on Sky. ODB exits the ring and goes to Gail and Tapa. The referee tells her to go back in the ring. Brooke nails ODB from behind and then continues the attack. Sky runs over and knocks Brooke down. Sky brings Brooke and ODB in the ring. She covers Brooke but she kicks out at two. She covers ODB but ODB kicks out. Sky goes for a whip but Brooke hits her with a closeliine. Brooke climbs the corner as ODB and Sky stand. Brooke jumps and hits both of them with a flying cross body. Gail and Tapa gets on the apron and Sky talks to them. Brooke hits Sky but Sky fights back. Sky kicks her and goes for the face buster, but Gail comes in from behind and knocks Sky down. The bell sounds. Gail hits Brooke with Eat The Feet and then Tapa hits the wrecking ball on Brooke. ODB takes Gail out of the ring. ODB and Tapa stand tall. ODB hits her multiple times. She runs in the ropes and comes back but Tapa grabs ODB by the throat and then lifts her up and hits the wrecking ball. Gail Kim gets in the ring and grabs a mic. She asks if this is her competition. In fact, she beat everyone in her division. She doesn&apos;t have any competition. Now with Tapa, she is unstoppable. She issues a Open Challenge to any woman who doesn&apos;t work for TNA. If you can beat her, you can get a title shot. She doubts anyone can beat the first and longest reigning Knockouts Champion in TNA history. Tapa raises Gail&apos;s arm as she holds the title high. A video is shown that is from the "Fans of AJ". It shows AJ taking the title from TNA and going to AAA in Mexico where he defended it. Another video hypes up this month&apos;s One Night Only PPV. Jeff Hardy is shown warming up backstage. A photo loop is shown as it features Jeff Hardy vs. Austin Aries from BFG 2012. Jeff Hardy went on to win the title from Aries. Garett and Knux are backstage. Garett tells Knux that maybe he is right. Bully Ray then comes into the picture and pats Garett on the back and asks who is right? Ray says he knows everything that goes on with the group. He knows their talk with Mr. Anderson. Garett says they were going to tell him but they haven&apos;t seen him yet. Ray tells them that Aces are about "us" not "him". Garett asks when the last time it was all of them. What about the votes? Ray says they all vote. Knux says they haven&apos;t voted in a long time. It is always Ray&apos;s decisions. Garett gets in the middle and tells them this is what is splitting the group apart. Knux pounds on the table and says he has had enough. He says they are all going to vote tonight. They ALL will. Them and Taz. It&apos;s happening. There is nothing Ray can do about it. Knux leaves the scene. Ray grabs Garett&apos;s shirt and tells him to keep Knux in line. Ray turns and looks on a bit of a worried state. Dixie Carter is backstage on her phone. She is yelling at the person on the other end. She is asking how this is happening? She doesn&apos;t care about advertising and about affiliates. She wants it fixed now! She ends the call and throws the phone. Ethan Carter III comes into the picture and walks into her room. Dixie states she is glad to see his face. Dixie says she will let Ethan pick his opponent tonight. Ethan says it has been tough working in the company. He thought it was going to be easy. Dixie says it can&apos;t be easy. Ethan fought world class athletes and he says his streak may come to an end tonight. Dixie says that can&apos;t happen. She goes on to say to pick the right opponent. They are the Carters and the world needs them! Garett Bischoff and Knux are in the ring. Garett states they are going to decide the future of the Aces & 8s. They invite Taz in the ring. She comes. Garett then invites Bully Ray. Bully Ray comes down the ramp and makes his way into the ring. Ray grabs the mic from Garett and yells to shut his music off. Ray looks at the members and then looks at the camera and asks, "Do you know who I am?" Garett says they all know who he is. He is the poison that tour the group apart. Since day 1 it has been about Ray, Ray, Ray and his ego. It has never been about them. Whether he wants it or not, the vote is going to happen now. Just then, Mr. Anderson&apos;s music plays. Anderson walks down the ramp with a mic in hand. He has water bottle in the other hand. Anderson says he just got a better view of the situation. Carry on. Garett is shown in the ring and he says he is finished. That is his vote. He gives the mic to Ray. Garett takes off the vest and puts it on a ring post. Ray gives the mic to Knux after saying Knux has always been his rock. Do the right thing. Knux says he never needed Ray, the vest, or the colors. He is done. Knux takes the vest off and puts it on another ring post. Bully Ray states that they will have a tie. They want out but him and Taz will vote to keep it alive and the last vote goes to Ray for the tie breaker. It goes to the President. He votes to keep it alive. Ray states Taz is his best friend. He knows what his President tells him to do. Taz grabs the mic and looks at Ray. He says he needs to pump the breaks. They have done the best thing their entire careers on their own and together. Taz states that Ray knows it has been about him all along. He knows, Garett, Knux, and Ken know. Taz says he is done. He is out. Taz takes off his vest. Ray tells Taz to put his colors back on. Taz replies, "Make me!" Ray twists his hat backwards while Taz stands right in front of Ray. Ray is going to say it one more time and he better fall in line before he falls on his face... "Put your colors back on." Taz says to make him put it on. He will destroy him. Make him! Ray goes by the ropes and blames Mr. Anderson for all of this. Ken says Ray doesn&apos;t have anyone else to blame. Ken then goes on to state Turning Point on November 21st. He doesn&apos;t want to wrestle Bully Ray... he wants to fight him. He makes it a No DQ match. Ray states that he can&apos;t stand Anderson. Kenn respects Stone Cold Steve Austin so much, but he forgot the first rule! Just then, Garett and Knux attack Ken from behind. They slam him into the steel steps and then bring him in the ring. Garett gets him up and whips him to Knux. Knux does a huge big boot to Ken&apos;s face. Ray then gets his chain and whips it three times to Anderson&apos;s body stating, "Don&apos;t trust anyone." "When you ride with Aces & 8s, you never walk alone." The Aces aren&apos;t going anywhere. Chris Sabin is backstage warming up for his match later tonight. Mike Tenay and Taz are shown at ringside. Taz is smiling away while Tenay is disgusted by him. Just then, Roode is there. He grabs a mic and yells for Angle! He wants Kurt! He says he is going to kick Kurt&apos;s @ss tonight. Roode wants him. Get him out here! Roode is pounding on the apron and the announcer&apos;s table. Just then, the lights go out. Ethan Carter III comes out. He walks down the ramp. He gets in the ring. Just then, music hits. Dewey Barnes comes out, runs down the ramp and gets in the ring. Ethan Carter III grabs a mic. He states that he is EC3 and he is a Carter. The world needs us! Ethan smiles and then shrugs. Joseph Park is backstage picking through his Halloween candy. Nothing is better than eating leftover Halloween candy. Bad Influence comes beside him and hold him down and they state that he was out trick or treating but Abyss was here last week. Now Park is here this week and Abyss isn&apos;t. Park doesn&apos;t know what they are talking about. Influence dumps the candy on Park and then Eric Young comes to the save. He says he is a scientist and says they can fight tonight out in the ring and not back there. Influence leaves and Park thanks EY for showing up. Christy Hemme is shown ion the ring as she introduces the next match. Bad Influence (Daniels and Kazarian) come out and dance their way down the ramp. They get in the ring and Daniels&apos; drinks an Appletini. Eric Young and Joseph Park come out. The crowd pops. They get in the ring. Daniels starts the match with EY. The crowd chants, "EY, EY, EY." Young and Daniels move around the ring. Kazarian enters and hits Young from behind while Daniels hits Park on the apron. Influence double whip Young but Young knocks them down one at a time. He tags Par and they double whip Kazarian. They knock him down. Park gets him and does a body slam and stomps on him. He then tags Young. Young enters and he does a hurricanrona and Kaz flies to the outside. Young then does a suicide dive on him. He brings him in and climbs the corner. He jumps and does a cross body. He covers but Kaz kicks out. Kaz whips Young in the corner and Young spins around and lands on the apron. He does a strut but Daniels attacks him and Young falls down. He brings Young in the ring. Kaz holds him and he tags Daniels. They twist his arms and then Daniels kicks him from behind. They have Young down and Daniels covers but Young kicks out. Daniels pounds Young&apos;s face right into the top turnbuckle. He lifts Eric up for a back duplex but Young spins around and lands on his feet. He takes Daniels down. Kaz enters and distracts the referee as Young tags Park. The referee didn&apos;t see it. Influence is in the ring and they both attack Young. They whip Young but Young ducks and Kaz hits Daniels. Young tags Park. Park enters and works both opponents. He does closelines and body slams. Park runs and smashes Daniels in the corner. He goes for Kaz but he moves. Kaz does a missile dropkick but Park moves and goes for the Boston Crab. Daniels hits him from behind. Just then Young comes and takes Daniels outside of the ring. Chris Sabin is walking backstage. He is coming to the ring. Another camera shows Jeff Hardy. Their match is next. Kurt Angle&apos;s music plays. He comes out and has a mic. He says he is not a hard man to find. He tells Bobby Roode to come out here. He will be waiting. Music hits and here comes Austin Aries. Aries gets on the stage with a mic. Aries says, "With all due respect, I have been watching tonight and your mind and focus is on Roode, but next week is not fighting Roode... he is fighting Austin Aries." Austin has respect for everything Kurt has done and he knows why they called him Cyborg, but they also call Aries a Wrestling Machine. If Kurt doesn&apos;t bring 100%, then he has zero chance of defeating The greatest man that has ever lived. Just then, Dixie Carter is shown on the titan tron and she spins the Wheel of Dixie. It lands on a Submission Match. Dixie wishes them good luck. Aries walks up the ramp and Roode runs out and attacks Aries. He takes him down by the ring steps and continues to punch. Just then, Aries attacks Roode. They go around the ring. Kurt gets up and pulls Aries away and Kurt goes after Roode. Aries comes and pulls Kurt off of Roode and he goes after Kurt this time. Officials pull everyone away. Roode yells, "I am not finished with you." Music hits and here comes Jeff Hardy! Jeff runs down the ramp and interacts with the fans. Chris Sabin&apos;s music plays and he comes down the ramp as the crowd boos. He gets in the ring. Chris stands in the middle of the ring and extends his hand. Jeff looks at him and then around at the crowd. He moves forward but Chris goes for a kick but Jeff blocks it and pounds Chris&apos; face right into the top turnbuckle. Chris comes out and puts Jeff in the corner and stomps on him and then chokes him with his boot. Chris whips Jeff into the corner but Jeff pops up and does a hurricanrona. Chris slides out of the ring. Jeff does a baseball slide and then goes on the ring apron. He jumps and does a flying closeline. Jeff throws a trashcan in the ring and then goes back to Sabin and stomps on his gut. Jeff grabs a ladder that is on the outside. He brings it in the ring and then he gets in. Chris slides in too and grabs one side of the ladder as Jeff does. Chris rams one side of the ladder right into Jeff&apos;s gut as he is in the corner. Chris then sets up the ladder on the bottom rope. Chris takes Jeff up and has his body on the top rope and then does a spinning neck breaker on the ladder. Chris covers but Jeff kicks out. Sabin takes the ladder to the corner. He gets Jeff up. Sabin goes for a suplex on the ladder. Jeff goes for one now but Sabin blocks it. Sabin runs the other way, and then runs to Jeff, but Jeff does a back body drop and Sabin falls right on the ladder. He bounces off it. Jeff grabs the trashcan as Chris stands. He smashes it right into the face of Sabin. He goes down. Jeff covers but Sabin kicks out. Jeff now grabs a crutch and smashes it into Sabin&apos;s gut. Jeff goes to the apron and then goes to ringside as he grabs a table. He unfolds it and breaks the ladder. He gets rid of it and goes to another table. He brings that table in the ring. Jeff gets the table and places it in the corner. Jeff grabs Chris in a power bomb position. He lifts him up but Sabin hits a hurricanrona. Both get up. Sabin runs to Jeff but Jeff hits him with an elbow. Jeff goes for the Whisper in the Wind but Sabin hits his feet and he falls on the top. Sabin grabs a chair and hits him in the back with it. He takes Jeff&apos;s body down and has his leg stuck on the top corner. He chokes him and then places the chair into the face of Hardy and does a baseball slide. Sabin then climbs the corner and stomps on Jeff&apos;s groin. Jeff grabs the chair and hits Sabin in the back with it. He then hits Sabin with the chair again as he is out of the corner. Hardy places the chair in the middle of the ring unfolded and then runs and splashes on Chris. He then closelines Chris out of the ring. Trainers and doctors come into the ring and check on Sabin. Velvet Sky also comes in and checks on Chris, her boyfriend. Jeff celebrates in the ring as the crowd cheers. The show fades. I am not sure how to react to tonight&apos;s show. Clearly there wasn&apos;t a lot of wrestling on tonight&apos;s show, but I am starting to get the feeling that TNA is fading away from the whole "Wrestling Matters". They tried that campaign and it didn&apos;t work. Now they are moving onto reality based programming which explains the endless promos and segments tonight. One example... Kurt Angle/Bobby Roode. These two simply were out every half hour. I mean, I am not complaining, but I can clearly see the new direction TNA is making. To continue, I like Gail&apos;s open challenge and I am curious to see who will accept it. Could we see a former Knockout make their return? Ethan Carter III and Dixie Carter continue to make me laugh with their idea of "tough competition". Sure, it may seem childish and stupid, but I just get a kick out of it. The main event tonight seems to be getting mixed reactions, but I enjoyed it. I do have to say writing coverage of a show is so different than just watching a match. In fact, sometimes it is better writing coverage of it because you get more involved. I enjoyed it, but I think I will enjoy Kurt and Aries next week even more. It could be one wrestling clinic in the ring. And finally, Main Event Mafia disband while Aces & 8s do a complete swerve on everyone and continue their reign. Honestly, what else are they going to do? Only time will tell.